The Folk Choir: What's happening in the Folk Choir? What's happening in the Folk Choir? Thursday 5 September is the final night for term three. We will be having fun with some chorus songs, and rehearsing the three songs we are taking out for the night on Wednesday 11 September to the Red Hill Folk Club. There'll be hot cuppas and hot singing! • 11 September: Folk Choir's floorspot at Red Hill Folk Club. Club starts about 7.30pm, at the Red Hill Community Sports Club, Fulcher Road, Red Hill, next to the Broncos' Leagues Club. We're on about 8. • 13-15 September: Neurum Creek Festival. The Wish List, featuring The Folk Choir's Nicole Murray and Emma Nixon, with three special guests from the Folk Choir (Rebecca Wright, Alexa Sheppard and Naomi Rowland) will be playing at 7pm on Friday 13 Sept. Earlier that afternoon, Alexa and Naomi are debuting their new duo, Fiddlesque, in the blackboard concert. It's all happening at Neurum Creek, which is 12km down Neurum Road from Woodford township, Sunshine Coast Hinterland. This great little festival is full of enjoyable acts, and chances to sing and play. www.neurumcreekfestival.com. 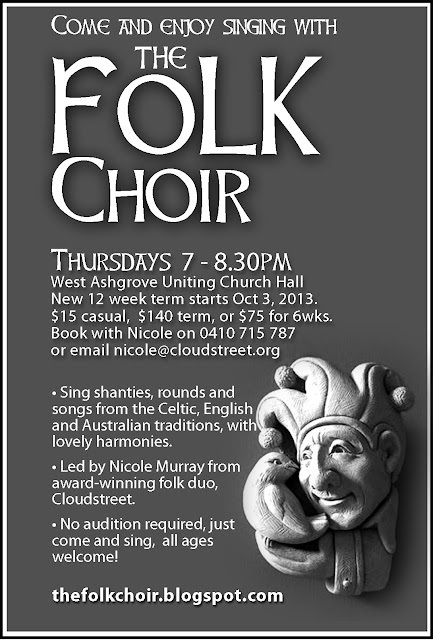 The Folk Choir starts a new twelve week term on Thursday 3 October! $15 casual, $140 for 12 week term, or $75 for 6 weeks. This term runs October 3 - December 19. THE FOLK CHOIR'S FAVOURITES - listen to our Spotify playlist here. $15 casual, or $130 for 10-week term paid in advance. Our new Summer Term runs 7 February - 11 April, 2019. There is a friendly welcome and a cuppa waiting for you from 7pm. The Folk Choir explores songs in two, three and four-part harmony, including sea shanties, traditional ballads about love and death, and contemporary folk songs with great choruses. Each night starts with vocal warmups and short songs, then working on parts for new songs, and finally finishing with a big sing. There's no need to be able to read music, and there's no audition, just come and enjoy singing. Casual attendees are welcome.